I recently received an email from a gentleman in Pakistan expressing interest in dome technology for building earthquake-resistant housing in that country. The massive earthquake a few weeks ago leveled thousands of homes, and the government is looking for ways to rebuild in safer ways. I responded that I thought that earthbag building would indeed be superior to conventional (un-reinforced masonry) building, and that I would put together a description of how to go about building a small dome that could serve for emergency (or more permanent) housing. So I pulled out a series of photos of building my first experimental earthabg/papercrete dome, a small (14 foot diameter) building that could serve a variety of functions such as cabin, studio, storehouse, etc. I assembled these pictures along with text describing exactly how to go about constructing the dome on three interconnected pages, beginning at http://www.greenhomebuilding.com/riceland.htm . It seems to me that given the alarming rate of natural disasters striking our planet, displacing millions of people and disrupting their lives, we would be well advised to rebuild homes that can withstand earthquakes, hurricanes, and floods. Earthbag domes have this potential...and they are inexpensive and easy to build, along with being environmentally friendly! "May your Tribe Increase", sustainable non ecology-damaging construction coupled with sustainable living systems is what the World needs now. Thanks for sharing your creativity. Absolutely fantastic site!! I commend you for the resources you have put together with the experts to communicate the future of home building. I hope to at some point in the near future build my own earth-friendly home, and your site is a great place to start. Thank you and your friends for their dedication and spirit. Hello, I came across your site while just searching around the web on green homes and architecture. I am currently going to HMI RMS (hminet.org) as a highschool junior. It is very environmentally based and I have always loved nature. I live in a small town in SW Vermont. I am very concerned with the environment and very interested in architecture. When I return home in december I will be beginning an architecture internship with a friend of my dads and hopefully get some good experience before I head to college. I just wanted to drop you a note because I am very inspired by what you have done and want to show my appreciation. It's a very, very beautiful thing. Thank you so much. Cruising, looking for quonset section rustable roofing and ran across your site. Since I'm building my own poured in place concrete very best nightmare to live in I've got too many questions, and too many "what if you did it this way?" so, shoot the architect and start building. Love your site, keep up the great work, and when it all falls apart (society) laugh loudest. (oh, and do invest in some fire arms) or a catapult! According to NOAA's Hurricane Research Division, an average hurricane releases about 6x10^14 watts through latent heat release during water condensation. This is approximately 200 times the world-wide energy generating capacity. On Monday, the beginning of the same week in which both Chevron and Exxon took ads out in the paper informing consumers of ways they could avoid using oil, in which George Bush expertly recommended 'not driving when you don't have to' as a fuel conservation strategy, and in which the sun produced 386 billion billion megawatts of energy…AGAIN, I spoke with Kelly Hart, an industry consultant on sustainable living, energy efficient building, and zero-emission vehicles. Championing the use of local materials, passive climate control, and the lessons to be learned from vernacular architecture and animal dens, Mr. Hart hosts an array of websites from which he offers advice in several green-living fields and answers technical queries on how to minimize one's ecological footprint. 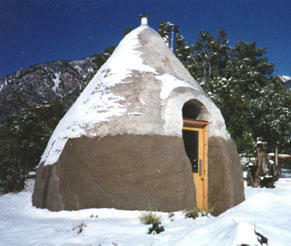 He spoke to me from his passive solar papercrete/earthbag home in Colorado. Chad Wasser: What does it mean to live sustainably? Kelly Hart: Sustainability refers to the ability to project into the future the livelihood of generations beyond the present day. In terms of architecture, we're looking at ways to conserve resources and energy. This might simply relate to choosing materials that do not offgas toxic chemicals, or it might relate to significant building designs that naturally capture and reuse all of the water and energy that is required for comfortable living within. CW: How do you feel sustainability can be applied to preexisting communities or developments, like the suburbs, where so much unsustainable infrastructure already exists? KH: Well, there are a lot of aspects to sustainability, some of which absolutely relate to the existing infrastructure. We're not talking about just building a home out of earth materials or a design that utilizes solar energy, we're talking about the complete use of things which might not be maximized. Recycling is very important; recycling things--and that would include existing houses. If you have a house that is not necessarily built right for energy usage, there are numerous ways to retrofit that house and change it to bring it into compliance with concepts that are more sustainable. Electricity use is something many homes could improve with things like fluorescent bulbs, front loading washers, or through the addition of solar panels--which now offer some financial incentive. CW: Your own home employs passive solar heating, how does this work? KH: I'm a tremendous proponent of passive solar. It makes so much sense and it is so very simple. It based on allowing sunlight to enter the home through windows, which in the northern hemisphere are south facing, and some sort of thermal mass to store the heat from the sun. Stone, brick, or pots of sand work very well. Heat is then stored and held much more efficiently than in gas heated homes, and its free! CW: I know you built your own home, and it seems to me many eco-friendly homes were built by their owners. Is this hands-on approach just more implicit to sustainably-minded folks? KH: No, it really just boils down to the building trade not appreciating the importance of sustainable building practices, but that is simply a matter of education. CW: What kind of home did you grow up in? KH: I grew up in a variety of homes, primarily wood frames homes in Idaho. Although my father was a builder himself and I learned a lot from him. So my interest and knowledge of building materials and new methods of construction does in many ways stem from my upbringing. CW: You have built your own zero-emission solar/human powered vehicle, and have plans for a larger scope production of what you call the SunVee. One could make the argument that transportation accounts for more of the energy we use and most of the energy used in bringing other goods to market. What are your thoughts on sustainable practices in transportation, and zero emission vehicles like your own versus hybrids and hydrogen-fueled vehicles? KH: Well, that's right. Transportation is, I think, the number one consumer of fossil fuel. Surprising, I read recently, that our food is number two. Clearly what is going on now in transportation is not sustainable. There is no way the fossil fuel reserves are going to take us much farther than a few more decades. Its pretty clear, scientific even. Therefore its just going to get more expensive for consumers, more expensive to bring it up from the ground, refine it…and then there's the environmental costs. The effect of burning fossil fuels on the atmosphere…the effects on air quality make is clearly an unsustainable approach. Obviously we need to find ways to create or refine more reliable, sustainable energy sources. The SunMobile that I created is an adaptation of one approach. By simply converting sunlight directly to electricity through photovoltaic panels, it is able to charge batteries which can then power a motor. This can only be used directly for a relatively short period of time and, therefore, only used for fairly short distances. But fact is most of our driving is done just in the neighborhood within a few miles of the home, so it is very practical to have a neighborhood type vehicle. For the time being, hybrids are a good idea. They definitely achieve far better miles per gallon, so they are helping the problem. They are not solving it obviously , they still use gasoline and are still sending out emissions, so they're only one step in the right direction. But they also do have a tendency to educate the public to the fact that the electric side of the hybrid is a viable way to power a car. Education and familiarization will be crucial steps in our fuel conversion. CW: In your eBook "Which Hobbit Lives Here?" you compare yourself to a hobbit living in a man's world. Is there an aspect of role-playing or escapism in the motivation to build this alternative lifestyle? KH: Uh, well, I think there's probably some of that in me and the people like me that chose to move back to the land. People who chose to have a more primitive lifestyle. Although I have certainly embraced much of modern technology. I'm kind of a hybrid person myself. I like simple things…but I'm also connected to our digital world. I spend a great deal of time on the computer and I have been involved in media, video, film, and have been a producer for much of my life. So I'm coming from that angle. CW: You sell plans for sustainable home designs on your website dreamgreenhomes.com. You also sell twelve plans for doghouses using alternative building materials like rammed earth, straw, cob…I was wondering if you could talk a little about these small building projects and also your personal relationship with animals. KH: One of the architects who I represent on Dream Green Homes (Katje Erickson) had a collection of alternative doghouses that were pretty cute and interesting and fairly educational for people who want to build a small project with natural materials. They are a great way to showcase the mechanisms of sustainable architecture. As for my relationship with animals, it is very close. I consider myself an animal. I think we can learn a lot from animals. Our physiology and our psyche stems from our animal evolutionary beginnings. I have a great deal of connection with animals. One of the video projects I produced awhile ago was called: "Telepathic communications with animals" and I am completely convinced there is a great deal of telepathy between us and among animals. In terms of architecture design we could learn a lot from the way animals utilize materials and resources for creating their habitat. Their efficiency and resourcefulness in using what they have available is simply superior to ours. Simple things like learning the value of digging into the earth. For example, if you dig down 6 feet into the ground, whether you are in a hot climate or a cold climate, the temperature only varies a few degrees. There is a great deal of energy that can be conserved simply by burrowing to that depth. There are inevitable lessons in many forms of animal habitation. www.greenhomebuilding.com A sustainable architecture information jackpot. www.dreamgreenhomes.com A database of sustainable home designs. www.sunvee.com The proposal and business plan for his zero-emission neighborhood EV.